This post belongs to a series about search engine optimization (SEO) with Magnolia CMS. Today we look at inserting HTML links. Navigation links should be rendered as HTML to make them easy for crawlers to read. Search engines take the anchor text of a link into consideration when indexing it. Graphics and Flash objects, used by many designers to control look and feel, normally cannot be crawled. Alternative text descriptions should be provided. Use of uncrawlable elements also hinders users who do not have the required browser plug-ins. Since the navigation system is a site-wide collection of links to topics, links should be consistent throughout the site. Navigation is also a perfect opportunity to include descriptive keywords. 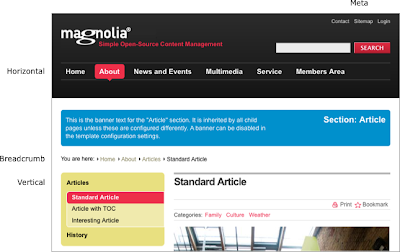 The Magnolia Templating Kit offers four navigation structures out-of-the-box: horizontal, vertical, breadcrumbs, and meta-navigation. All of them render links as HTML. Consistent navigation is enforced throughout the site using the same template.